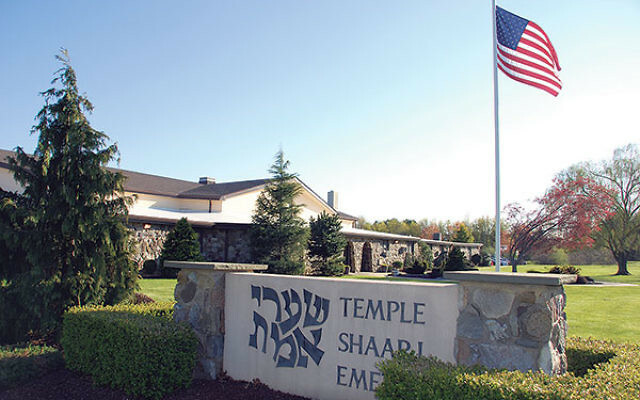 Founded in February 1966, Temple Shaari Emeth moved into its own building in 1969. At the April 15 celebration of the 50th anniversary of Temple Shaari Emeth, Rabbi Richard Jacobs, president of the Union for Reform Judaism, hit all the right congratulatory notes and asserted that Reform Judaism is strong and poised for future growth. The speaker praised Rabbi Melinda Panken and Cantor Wayne Siet, Shaari Emeth’s clergy, for leading a congregation that sings and participates. He also saluted Rabbi Emeritus Philip Schechter for encouraging a spirit of innovation and inclusion during his 1971-2000 tenure. The celebration included a dinner for 120 congregants and guests and a service that drew about 250 and featured brief remarks by Panken, Siet, and Schechter, as well as a proclamation by Manalapan’s mayor, Mary Ann Musich, and deputy mayor, Susan Cohen, recognizing the temple for its 50 years of accomplishment. Schechter, the congregation’s second pulpit leader, recalled his early days when — before the idea was well accepted — Shaari Emeth created its own prayer book using gender-neutral language. Schechter credited the opening of the Verrazano-Narrows Bridge for the temple’s rapid growth. “We had a steady stream of transplanted New Yorkers moving into our area. I even suggested we cap membership at 500 families, but when another Reform congregation began operating in Marlboro, our board decided to reopen enrollment, and membership peaked at about 850 families.” It now stands at about 600. Panken, who has been at Shaari Emeth for 13 years, emphasized the temple’s commitment to tzedaka and social justice. “Over the years, we have created a community that cares,” she said. “The spirit of inclusiveness in our congregation is reflected through special-needs programming, an LGBT-friendly atmosphere, and the delivery of food to those who are sick,” said Panken. Siet credited Schechter with being a mentor and a friend and for helping to “make me the cantor I am today.” He also extolled the harmonious relationship he has had with Panken, both musically and in their day-to-day activities. The cantor praised Shaari Emeth’s Zimriya musicians and its junior, teen, and adult choirs and choir leader Kevin Daly. And he recalled with pride an earlier milestone anniversary — the 18th — when Rabbi Alexander Schindler, president of the Union of American Hebrew Congregations, the forerunner of URJ, visited the synagogue. “He remarked how wonderful it was to hear a congregation sing so beautifully during services, and that remark made a lasting impression on me,” said Siet. Written comments from past notables unable to attend the event also were read from the bima. Rabbi Peter Kasdan, the temple’s first religious leader (1969-71), recalled the excitement of dedicating a cornfield that would become the synagogue’s new home and then watching the construction crew do its job. “At the very first bat mitzva at which I officiated, Dana Smookler brought her guitar music to our bima, and years later, I was able to attend her investiture service at New York’s Temple Emanu-El as she became a cantor,” said Kasdan. Event chair Joan Fischer thanked the following members of the 50th Anniversary Committee: Debbie Bonomo, Bonnie Kass Viola, Jennifer Fessler, Joan Goldberg, Michael Karlin, Shelly and Larry Belkin, and Betsy Millman as well as committee members Dale Goldberg and Sherry Edwab, who planned the dinner.